Halo, aka CTW Halo Jen, is an outgoing, just-turned 3-year-old female, born July 22, 2003. 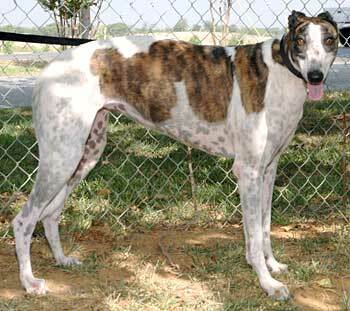 This white and brindle girl is the offspring of sire, TNT Star Wars, and dam, Flying Hoover. Halo decided to give racing a shot in the fall of 2005, but after 8 races at the Corpus Christi track, she decided life in a home was more to her liking. With a grin that stretches from ear to ear, Halo promises lots of laughs for her new family. It is not known at this time if she is small animal or cat tolerant.